Brian Head resort and nearby Cedar Breaks National Monument are recreational gems which have hidden from the masses since their founding. Located in the mountains east of Cedar City and Parowan, Utah, Brian Head is becoming a major destination for those seeking cool summer temperatures, mountain scenery and recreational opportunities ranging from skiing and snowmobiling in the winter to mountain biking, 4-wheeling and fishing in the summer. 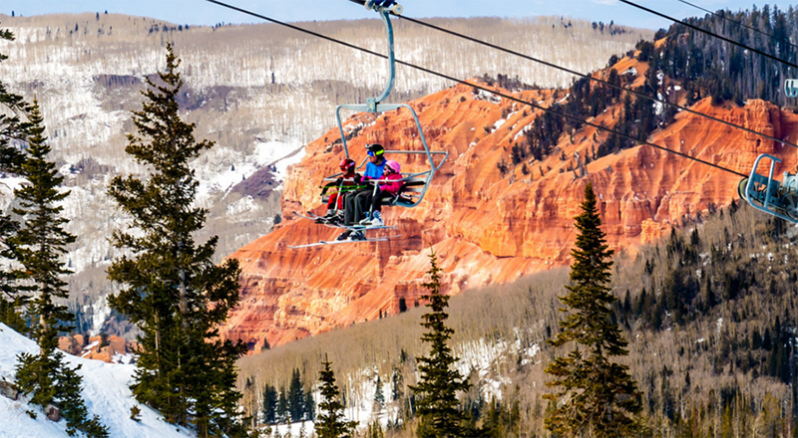 When most tourists come to Utah, they are likely to be seeking red-rock scenery or snow-covered ski resorts. With Zion and Bryce Canyons in the southwestern and Arches and Canyonlands in the southeastern corners of the state, Cedar Breaks is not on most people’s “radar screen” when it comes to high-desert landscapes. And with northern Utah’s booming ski industry and famous resorts like Park City and Snowbird, few think of southern Utah as a ski destination. Surprisingly, Brian Head and Cedar Breaks bring red-rock landscapes and world-class skiing to one location. It may be even more shocking to learn that, although it’s situated 150 miles south of Utah’s famous Wasatch Range, Brian Head is the highest ski resort in the state at nearly 11,000 feet! With the growth of sun-soaked towns like St. George and Las Vegas, Nevada, desert-dwellers are discovering that the best place to trade golf-clubs for skis or to escape sizzling summer temperatures, is just a short drive away. Recent improvements at Brian Head include a high-speed quad lift, which takes skiers and snowboarders to 11,000 ft. in just a couple of minutes, and a small fishing lake, stocked to the gills with rainbow trout. And Brian Head has a spectacular Independence Day celebration each year. There’s something refreshing about watching fireworks on the 4th of July, while wearing a jacket or snuggling under a blanket! And, if you’ve never seen the wild flowers which seem to peak in early August, you won’t want to miss it!